Definition at line 34 of file network-monitor-stub.hpp. Definition at line 102 of file network-monitor-stub.cpp. Definition at line 114 of file network-monitor-stub.cpp. Definition at line 120 of file network-monitor-stub.cpp. If specified interface name does not exist, this operation has no effect. Definition at line 126 of file network-monitor-stub.cpp. 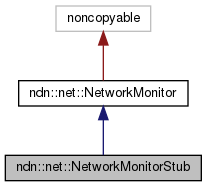 A real NetworkMonitor starts with an "enumerating" state, during which the initial information about network interfaces is collected from the OS. Upon discovering a network interface, it emits the onInterfaceAdded signal. When the initial enumerating completes, it emits the onEnumerationCompleted signal. To simulate this procedure on a newly constructed MockNetworkMonitor, the caller should invoke addInterface once for each network interface that already exists, and then invoke signalEnumerationCompleted . Definition at line 132 of file network-monitor-stub.cpp.